The J. S. Dorton Arena is one of North Carolina's foremost contributions to modern architecture. Part of the state fairgrounds complex, it was built as a livestock-judging pavilion, but today serves as a year-round exhibition and performance center. Since its completion in 1952, the building has been acclaimed internationally for its innovative fusion of architecture and engineering. The arena's bold parabolic design was conceived by Matthew Nowicki, a Polish architect who helped lay out the rebuilding of Warsaw following World War II. Nowicki assisted in designing the United Nations complex in New York before coming to Raleigh, where he served as acting head of the School of Design at North Carolina State College (now North Carolina State University). When local architect William H. Deitrick was commissioned to design the expansion of the fairgrounds complex, he engaged Nowicki as a consulting architect, giving Nowicki full charge of designing the livestock pavilion. 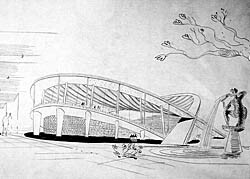 Nowicki executed approximately 100 conceptual drawings for the building, but perished in a plane crash in Egypt before construction began. Deitrick completed the pavilion's design closely following Nowicki's plans. The building's pioneering form garnered numerous international design awards. In 1957, the American Institute of Architects declared it one of the 10 20th-century buildings most expected to influence the future of American architecture. In 1961, to honor a long-time state fair manager, the name of the building was changed to the J. S. Dorton Arena. The arena is a designated Raleigh Historic Landmark. J. S. Dorton Arena is located at 1026 Blue Ridge Rd., in the North Carolina state fairgrounds complex. It is open regularly for public events. For more information call 919-821-7400 or visit the state fairground's website.